Also adds a "sell all" button to the merchant frame. Yes, this is just like FuBar/Broker_GarbageFu. It has all the crap I didn't use stripped out, though. So it's 90kb with libs, instead of GarbageFu's 300kb. I'm such a size queen. Noticed you've done some work on this. Will it be pushed through to Curse soon? Tatewaki: I have no objections. I'd like to ask you if it would be okay for me to post a modified version of the addon called ProfessionBars to the authors page, to ask him if he would include those changes in his addon.. The reason I'm asking you first is because I used a bit of your code from this addon and I'd like to make sure you're okay with it before posting it.. Stumbled upon following error: "DropTheCheapestThing Error: Can't sell items while not at a merchant. Aborting." Happens for every merchant, not sure where to check further. dekimsey: No, which is why it was removed a few months ago. Is an item library necessary now that the game provides the sell price on all items (wowwiki:GetItemInfo)? Needs to be updated with all the trash you get from fishing now. Great mod, love the size. Thank you! I tried using the updated version of DropTheCheapestThing and it messed up my Omen addon. 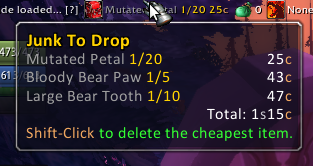 Put the previous version of DropTheCheapestThing back and both worked properly. Just wanted to say thanks for this graet addon!! I have been using Garbage_Fu since it 1st came out, and had loved it, but it was beginning to break/use too much memory, and Dropthe.....is easily the greatest replacement I have come across so far. One thing I like about Garbage_Fu was how it tracked how much profit one had made over time selling grey items, but its certainly not something I need (and I assume it would eat up a good amt. of memory to incorporate it, which is what your trying to avoid in the 1st place).....So, thanks again, keep up the great work! !